Remember That Starbucks Cup Incident? This is a soap box. Allow me to stand on it. Whoever designed the 2015 Starbucks holiday cup was looking for a fresh Christmas design- one that hadn’t been done to death over the past sixty years, which have seen a ruthless increase in holiday commercialism. Sometimes, in a ‘diminishing-returns’ design scenario, brick walls are hit. Santa and snow men and snow flakes and sleighs – they’ve been used to death; it’s not like any of those things are “Christian” either, but that’s a whole other load of knuckle-dragging logic-fail that needn’t be addressed here. The design team likely had a meeting, looked at a few dozen proposals, and opted for the one design that didn’t look like any of the others (or any of the designs from previous years that had already been used). Minimalism isn’t a bad thing, people. And we all know that red and green are the colors of the season – just look at the trees, candy canes, and mistletoe. Shake it off. Nobody’s coming for your bible. 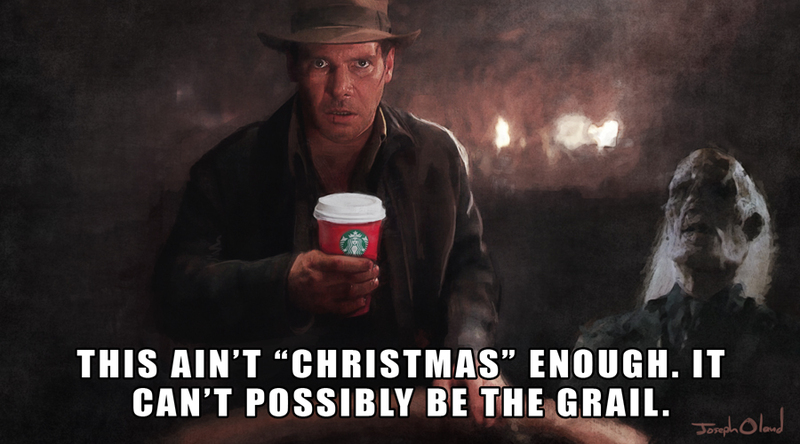 This entry was posted in Meme Central and tagged christian right, christianity, conspiracy, extremism, harrison ford, holy grail, indiana jones, joke, meme, radicalism, satire, starbucks, steven spielberg, temple, war on christmas. Bookmark the permalink.